This is a term applied to all hardware used in building construction but particularly that used in connection with doors, windows, cabinets and other moveable items. This is the plate on which either a handle or mortice knob are mounted. This is the distance from the edge of the door to the centre of either the spindle or the key hole. This is a lock which can be fitted to any internal door which has a latch operated by the handle and a bolt operated by a turn and release mechanism opposed to a key. When this type of lock is used with lever on rose handles the turn and release is purchased separately and should match the style and finish of the selected lever. These are lever on backplate handles with a built in turn and release mechanism for use with a bathroom lock. British standard covering lock security. The level of security strongly recommended by the police and many insurance companies. The standard includes many security features ensuring the lock is resistant to attack by drill, saw or force. Used to hold a door in the open position. Generally used to hold double doors or French windows. This is the metal body of a lock or latch housing the mechanism. These knobs are rigid, opposed to mortice knobs which together with a spindle can be used to operate a latch tongue. This is a key hole cover that has a plate which hides the key hole when not in use. This term refers to the circular rose plate that a mortice knob or lever is mounted on, when it is concealed it means that the screws and fixing holes are hidden from view by a blank cover plate. This is a standard mortice lock, which is set into the edge of a door and contains a square ended bolt operated by a key or a turn and release mechanism. This is the surround plate used to cover the key hole cut out on a door. The name given to a window over a door or the top light of some windows. This is simply a plate used to cover the area of the door that is most likely to be touched. Therefore protecting the finish of the door from wear and tear. This is the face plate of a lock or latch which is visible on the door edge, through which the latch tongue and the bolt protrude. This is the spring loaded tongue, operated by a handle which secures the door closed but does not lock. E.g. Three lever sash lock – in this instance it refers to the amount of levers inside the lock which are operated when the key is turned. Usually the more levers a lock contains the more secure it is. Most insurance companies require a five lever lock to be fitted to all external doors. This is a horizontal lever for operating the latch mechanism. These handles are usually spring loaded to ensure the lever returns to its horizontal position. Lever handles may be preferred to mortice knobs where the door is often used by people passing through with their hands full. It is fairly easy to depress a lever with an elbow, whereas a mortice knob requires a free hand to operate it. This is a recess cut into the edge of a door to receive a lock or latch case. This is a door knob with a spindle which can be turned to operate a latch tongue. Opposed to a centre door knob or cupboard knob which are rigid. It is important to select a lock that has a backset of at least 80mm, in order to ensure that knuckles don't scrape against the door frame during operation. Double doors usually have a rebated edge where they come together when closed. When fitting mortice locks or latches it is necessary to purchase a rebate kit to enable the forend/strike plates to fit correctly. This refers to locks or latches which are fitted on to the face of a door, opposed to a mortice lock or latch which is fitted into a recess cut into the door. A set of rim lock furniture usually consists of a pair of rim knobs, a spindle, a rim lock and an escutcheon (key hole cover) for the outside face of the door. A set of rim latch furniture is the same apart from the fact that an escutcheon wouldn't be required as there would not be a key hole. This is an alternative way of securing a door closed instead of a latch. A roller bolt can be operated by a simple pull handle. This is a circular plate on which the handle or knob are mounted. 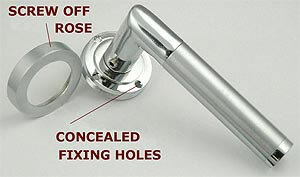 A concealed rose simply means that the screws and holes used to fix the rose to the door are hidden by a cover. A mortice lock containing both a latch (operated by door handles) and a bolt (operated by a key). This is a small button or switch on the case of a nightlatch which can be used to lock the latch tongue in an open or closed position. This is a square bar inserted through the latch case which connects the handles and enables the latch tongue to be operated. This is a plate fixed to the door frame with one or more holes, into which the latch tongue or bolt engages. The turn used to operate a bolt or privacy lock where a key is not required. This is a much smaller piece of equipment than say a box latch. It requires a much smaller recess to be cut into the door and is therefore much quicker and easier to fit. Used with a bathroom lock for privacy purposes, usually on bedroom or bathroom doors. By operating the thumb turn the door can be locked from the inside without the need for a key. They can also be operated from the outside with a coin or screwdriver for emergency opening. Lever on rose furniture is more contemporary, it can be used alone if only required to operate a latch. If used on a door with a lock and a latch then an escutcheon (key hole cover) or turn and release will also be required. Obviously care needs to be taken when selecting these additional items to ensure that the style and finish match those of selected handles. Mortice knobs are becoming more popular, much the same as lever on rose furniture, you will also require an escutcheon or turn and release if used with a sash lock. It is important to bear in mind when choosing mortice furniture, that it is more difficult to operate a door knob than a lever that could be operated with an elbow if your hands are full. It is also important to use a latch or lock with a backset of at least 80mm, to ensure enough clearance from the door frame. Lever on backplate are more traditional with three styles of lever. Lever latch is used on most internal doors which you do not wish to lock. Lever lock has a key hole cut out in the backplate and is used with a sash lock. Bath sets have a turn and release mechanism built into the backplate and are used with a bathroom lock. All our lever on rose furniture are supplied with matching screws, a spindle and fitting instructions. Our lever on rose furniture have concealed roses, this means that the screws and fixing holes are hidden by a cover. For doors that you have no wish to lock, they are generally fitted with a simple tubular latch. For doors that you do wish to lock, it will be necessary to purchase an escutcheon (key hole cover) together with a sash lock. For bedroom or bathroom doors that you may wish to lock without a key, you would need to purchase a turn & release (thumb turn) together with a bathroom lock. All our mortice knobs are supplied with matching screws, a spindle and fitting instructions. As with lever on rose furniture, when using with a sash lock you will also need to purchase a matching escutcheon (key hole cover). When using with a bathroom lock, you will also need a matching turn and release (thumb turn). Please bear in mind that mortice knobs are not quite as practical as lever furniture. Levers can be operated with an elbow if your hands are full, whereas a mortice knob requires a free hand to turn it. It is also important to ensure that all locks or latches purchased have a backset of at least 80mm to ensure sufficient clearance of the door frame. If this rule is not applied it may be possible for knuckles to scrape on the door frame as the knob is turned. All our lever on backplate furniture are supplied with matching screws, a spindle and fitting instructions. LEVER LATCH: Blank backplate, for use with a tubular latch or a box latch. LEVER LOCK: Backplate has a key hole, for use with a sash type lock which contains a lock and a bolt. BATH SET: Backplate has a built in turn and release mechanism, for use with a bathroom lock. The existing lock or latch suits the purpose you require. E.g. if you want to be able to lock the door with a turn and release mechanism, you may need to replace a latch with a bathroom lock. The SASH LOCK comprises of a latch tongue, to be operated by the handle and a bolt to be operated by a key. These lock have internal levers which are operated when the key is turned. For internal doors a three lever sash lock is usually sufficient. For external doors you should select a five lever British standard sash lock. Basically the more levers required to operate the lock the more secure the lock is. BS3621 is the British standard covering lock security. The standard is strongly recommended by the police and insisted upon by most insurance companies. The standard ensures that the lock is resistant to attack by drill, saw or force. The BATHROOM LOCK comprises of a latch tongue, to be operated by the handle and a bolt that is operated by a thumb turn and release rather than a key. 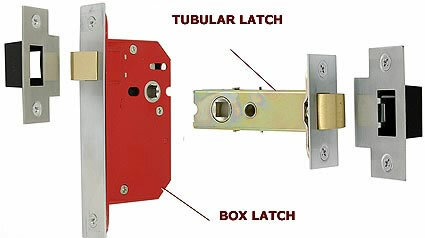 The TUBULAR LATCH is by far the most popular, due to its size and shape it is very quick and easy to fit. The BOX LATCH serves the same purpose, however as a much larger recess is required to be cut into the door, it is not quite as easy to fit. The choice is often determined by the existing latch that you wish to replace.